In Sub-Saharan Africa many more people have a mobile phone than access to electricity. While around 599 million remain unconnected to the electricity grid, mobile networks cover nearly three-quarters of the region’s 936 million inhabitants. How can this widespread mobile infrastructure be leveraged to benefit the 358 million people that have mobile phones but no electricity supply? That is the remit of the GSM Association’s Mobile Development for Utilities Programme (M4D Utilities), which is exploring ways in which mobile network operators (MNOs), utilities and governments worldwide can collaborate to deploy smart energy solutions, including smart metering and decentralised energy solutions, to take electricity inclusion to new levels. Working with Orange and supported by the UK Department for International Development (DFID), the GSMA has recently completed a study within the M4D Utilities programme to examine the market opportunity to use mobile-enabled energy services in Sub-Saharan Africa to improve energy access and service delivery. The study is wide-ranging but in this article we focus on the potential impact of mobile enablers on the region’s prepaid services. The GSMA’s research identified a number of key mobile services that could support smart energy solutions in the Sub-Saharan region. At the core of what MNOs offer are basic connectivity services – not just connecting individuals, but increasingly also machine-to-machine (M2M) communications. In theory, the widespread GSM footprint could be used to connect household smart meters to central servers and databases. But the GSMA concedes that this opportunity in Sub-Saharan Africa is dampened by the relatively high costs of GSM compared to alternative solutions such as power line communication. Mobile could eventually become more competitive on price as new mobile standards for low-cost machine communications become available, but this is still several years away. providing customer interfacing services such as call centre operations or bulk SMS text messaging. These types of services leverage the MNOs’ existing assets and, says the GSMA, would give energy service companies a platform on which they can innovate. The GSMA believes there could even be an opportunity for MNOs to provide energy companies with a full turnkey service that includes SIMs, smart meters, a data platform and technical expertise. 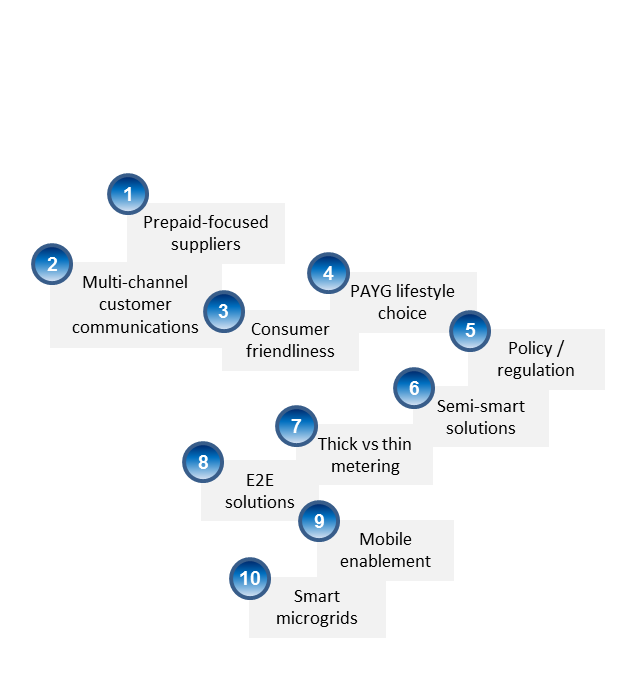 That is seen as a more risky play, but one that would have the advantage (from an MNO perspective) of placing mobile technologies firmly at the heart of the utilities’ business model. Some utility projects in the region have already demonstrated the benefits of leveraging mobile technology. For example, the Ugandan national electricity utility UMEME has carried out a project using mobile technology together with prepayment meters to address issues with non-technical energy losses and improve revenue collection. The utility started in 2007 by installing 360 GSM-enabled meters on power line feeders to identify the parts of the network with the greatest losses. This pinpointed the most inefficient feeders and helped UMEME locate 900 unbilled customers. In 2012, following a government mandate to improve revenue collection rates from 75% to 99% by 2018, UMEME began a year-long pilot to retrofit 8600 household with split prepaid meters at a cost of USD2.3 million. Within a year, UMEME had recovered USD1.5 million, plus another USD387,000 in late payment penalties. The split-meter solution made tampering more difficult and helped increase collection. Another benefit was that customers reduced their average energy consumption by 30%. UMEME is now considering an advanced metering solution to tackle theft by large power users. As part of its research, the GSMA analysed the market potential for smart metering and mobile enabling services in three sub-Saharan nations: Botswana, Ivory Coast and Senegal. For all three countries, the study found that the mobile services with the greatest potential to provide immediate benefits to utilities were customer communication and payment. Customer communication – for example, using bulk SMS services to tell customers about power outages or load shedding or to remind them to pay their bills or top up their prepaid accounts. Mobile payment – extending the use of mobile money for prepaid electricity and bill payment and expanding the payments partner network to encourage higher take-up. These recommendations are highly relevant to the evolution of prepaid electricity service in these markets. The national utility BPC has rolled out prepaid smart metering in urban areas, using a system from the China-based vendor Hexing. As well as supporting high revenue collection, the smart meters enable peak load control of hot water units to minimise load shedding. However, there are several ways in which prepayment service could be further improved. One issue is that the vending system sometimes goes down, leaving customers unable to buy power. This in turn puts pressure on BPC’s customer care services. Credit can be automatically uploaded to the meter, but this is not commonly practised. The feature is only available for purchases made through BPC, and the utility is reluctant to promote it because of concerns over network reliability. As a result, most customers rely on manually entering voucher codes using their meter keypads. The GSMA sees plenty of potential to grow the use of mobile money payments in Botswana, but this would require the expansion of the mobile money distribution network to make topping up this way more convenient. At present, using mobile payments has some drawbacks, as mobile money can only be topped at large dealers. The study also identified opportunities for BPC to take advantage of discounted bulk text messaging to improve customer communications for load shedding and peak demand control. Mobile communications could also help keep prepaid customers informed about their credit status and help drive the use of mobile money for recharging. CIE faces some significant challenges, including tackling a 50% rate of non-bill payment from existing customers and increasing the low rate of electrification in rural areas. The utility wants to roll out prepaid analog meters to most of its household customers to increase revenue collection and provide a better service to customers. It also plans to make 600,000 new rural connections by 2020, possibly with prepaid meters. CIE has found several weaknesses with the current prepaid system, which decrease its attractiveness for both customers and the utility. One confusing feature for customers has been the fixed-fee component of the tariff, which is collected with the first payment in each two-month period. If a user doesn’t top up for, say, six months, then the three fixed-fee payments owing are deducted from the next top up. This leaves customers unsure how much electricity they are actually buying. This issue is now being addressed by putting linear tariffs in place. Another disincentive for customers is that there is a lack of third-party prepaid electricity vendors, which limits the convenience of using the system. CIE also found that fraud became harder to control with the prepaid meters, as agents were no longer visiting customer premises to read meters or collect payments. With mobile money taking off in Ivory Coast and prepayment a major strategy moving forward, the GSMA sees a good opportunity for MNOs to support CIE to increase the use of mobile payments for recharging prepaid accounts. Senelec had some problems with its initial prepaid deployment, which it discontinued in 2005. 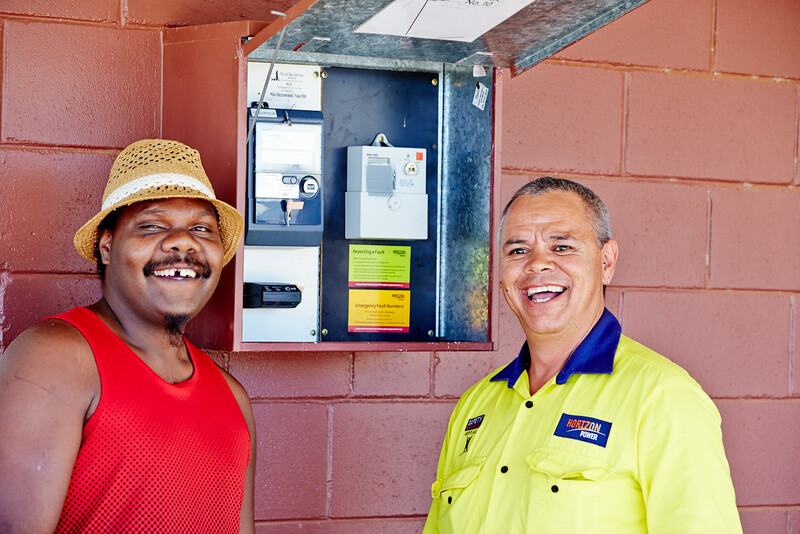 Contrary to expectations, the prepaid meters significantly decreased revenue, and so Senelec has now switched to split meters to reduce tampering. The service also lacked convenience for customers, as after 2005 prepaid vouchers could only be bought from the utility’s main offices. Customers with postpaid accounts can use mobile payments to settle their bills, but the processes are not automated and transactions cannot be handled in real time. The GSMA found there were strong opportunities for MNOs to increase the use of mobile money for prepaid top-ups and bill payment, as well as use text messaging to encourage mobile payments and inform customers of load shedding and peak demand control. While mobile-enabled energy services are as yet undeveloped in the three countries surveyed in the GSMA’s study, there are signs elsewhere in the region of their potential. In Kenya, for instance, where 25% of Kenya Power’s electricity customers (over 675,000) are on prepaid meters, there has been a big shift towards mobile top-ups in recent years. When the prepaid service was first introduced in 2011, customers reported that it wasn’t easy to get tokens when they needed them and obtaining tokens was time-consuming. Since then, Kenya Power has vastly improved the distribution network, and tokens are available from various third-party vendors as well as in the utility’s banking halls. Moreover, customers can also top up from their mobiles using platforms such as M-Pesa and ZAP. Mobile payments are now the recharge method of choice, with over 70% of Kenya Power’s prepaid users topping up from their phones, according to the utility.